Want to get involved? Download the Soldiers Memorial Form and begin researching a soldier from your home! *please note that all surnames beginning with Mac or Mc are listed first. As these surnames are often misspelled, using either of the prefixes, we have combined them in our memorial to simplify your search. Samuel was born in Gravenhurst, Ontario on March 20, 1877. He was among the Canadian soldiers who fought at Passchendaele in 1917. In 1919, Samuel settled in Guy; his homesteads were located at 10-76-21-W5 and 16-56-5-W5. While building his home, Samuel fell while placing a heavy beam and hurt his head and shoulder. Shortly thereafter he lost his eyesight. Samuel died in 1943. Ed was born on May 2, 1889 in Cress Hill, Scotland. He and his brother Jock immigrated to Canada in the early 1910s, settling first in Saskatchewan and in 1913 came to Spirit River. Ed's homestead was located at 5-78-5-W6. He was drafted in 1918 and returned to his farm after being discharged in 1919. In 1928, Ed sold his farm and moved to British Columbia. He eventually returned to Spirit River because of his poor health. He died on March 29, 1961 and was buried in the local Legion cemetery plot. George was born in Edmonton, Alberta on July 6, 1899 (1900?). When he was drafted in 1918, George was living in Penticton, BC. Having been drafted so near the end of the war, he served only in England. George settled in the Teepee Creek area in 1930 and settled on SE 1-74-7-W6. He died in 1957 and was buried in the Teepee Creek cemetery. Ernest was born in Owen Sound, Ontario on July 18, 1885. He enlisted in Calgary in May of 1915. In November of 1916, Ernest received gunshot wounds to his left leg and face. He was also gassed on April 9, 1917, the first day of the battle of Vimy Ridge, and suffered from a constant cough afterwards. Ernest filed on a homestead at 19-73-10-W6. According to his service file, he died on July 13, 1977. George was born in Fraserburgh, Aberdeenshire, Scotland on April 15, 1895. He settled in Teepee Creek after the war, filing on a homestead at 28-74-3-W6. George died in May of 1924 after being kicked by a horse. Bill was born in Credit Forks, Ontario on September 23, 1891. He enlisted in Regina in October of 1914. On August 1916 at Ypres, Bill received gunshot wounds to his right buttock and thigh. He was also buried by a shell in 1916, though it is uncertain whether or not this occurred at the same time. Because of his injury, Bill was "marked for Canada" and discharged in December of 1918, earlier than many other soldiers. He settled in the South Peace after the war and filed on a homestead at 27-80-8-W6. Bill married Olive, a widow with a young son. The couple had four more children. In 1946, Bill and Olive moved to Vancouver. Bill died in Vancouver on April 21, 1965. Gordon was born in Brighton, Ontario on August 27, 1894. He was living in Lake Saskatoon (homesteads located at 28-74-9-W6 and 20-74-9-W6) at the time of his enlistment in March of 1916. In March of 1918, Gordon was granted permission to marry Agness Gertrude. His service file states in September 1918 that he suffered from dementia, probably due to shell shock, and he was invalided to Canada in November of 1918. Gordon's service file states that he died November 2, 1924, though an estate notice in the newspaper gives 1925 as the year of his death. According to his biography in Pioneer Round Up, Gordon's death was as a result of being gassed during the war. couldn't find one born in the right year/right place..
Sources: surname DB; Along the Wapiti p. 300; news clippings? William was born in Ireland on July 24, 1897. He served in the British Army during World War I, and came the South Peace in 1928. On April 4, 1935, William married Doris Murchie. The couple had three children. During World War II, William served in the Veterans Guard. He died on January 21, 1960. MacDaid, Charles Edward Brendon "Ted"
Ted was born in Kilcormac, Ireland on August 22, 1895. He came to Canada in 1913, and in 1916, he once again crossed the Atlantic, having enlisted in the Canadian army. Ted was living in Saskatchewan at the time of his enlistment in January of 1916. In April 1917 at Vimy Ridge, Ted received gunshot wounds to his right leg, right arm, and eye. When he returned to Canada, he filed on a homestead southwest of Eaglesham (his property was located at ?-77-5-W6; 32-77-26-W5; 33-77-26-W6). Ted also served for some time in the Second World War. Neil was born in Stony Plain, Alberta on April 29, 1895. He came to the South Peace around 1915 and filed on a homestead at 31-77-5-W6. According to his enlistment form, he was living in Spirit River in 1918. Because he was drafted so near the end of the war, Neil served only in England. Roy was born in Ottawa, Ontario on November 19, 1894. When he was drafted in 1918, he was living in Grande Prairie; his homesteads may have been located at 28-71-5-W6 and 30-80-7-W6. 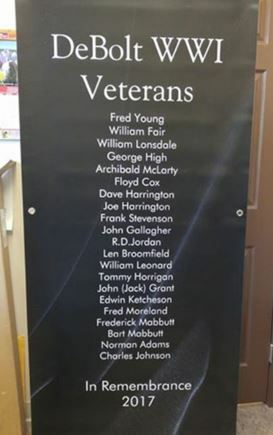 Roy served in England with the 1st Depot Battalion, Alberta Regiment and in France with the Canadian War Graves Detachment, and was discharged in 1919. Alex homesteaded the quarter NW 19-74-5-W6 around 1919, after having been discharged from the Canadian army. He did not stay in the area long. Allan was born in Stornoway, Scotland on October 27, 1893. He enlisted in Winnipeg in December of 1914. In June of 1916, Allan received a gunshot wound to his right shoulder, and in December of 1918, a dog bite to his left leg. Allan and his brother Donald settled in the South Peace in 1920; Allan's property was located at 31-71-8-W6, 36-70-9-W6, and 26-71-9-W6. In September of 1944, after having left the Wembley area, Allan married Gladys McAlpine Cutler of Vancouver. Donald was born in Stornoway, Scotland on October 27, 1897. He enlisted in Winnipeg in September of 1917. From June until August of 1918, Donald was in hospital with a bad case of influenza/bronchitis. In 1920 he and his brother Allan settled in the South Peace area; Donald's property was located at 23-70-9-W6, 19-71-8-W6, and 31-71-8-W6. After proving up his land, Donald took a job with the Soldier Settlement Board and moved to Grande Prairie. He married a Miss MacDonald of Wanham and gave up farming after their marriage. They eventually moved to Edmonton, where Donald died. Donald was born in Eburne, British Columbia on June 17, 1889. When he was drafted in July of 1918, he listed his address as Sexsmith. Donald's land was located at 3-74-4-W6 and 6-71-5-W6. George settled in the Wanham area in February 1919, after returning from World War I. His wife's name was Olive. They retired from farming in 1960 and moved to White Rock, BC. James was born on March 29, 1883 in Embro, Ontario. He came to the Beaverlodge area in 1911 and filed on a homestead at NW 14-71-9-W6. Later he also purchased 13-71-10-W6. In September of 1915, James enlisted in the Canadian army. He received a gunshot wound to his right hip in September of 1916 at Courcelette; it was severe but caused no disability. However, while on sick leave in London in November of that year, James was run over by a bus on Oxford street, causing a fracture of his left leg just above the ankle. He was sent back to Canada in July of 1917 and discharged in August of 1918, having been found medically unfit due to this injury. This injury affected James the rest of his life. He died in Edmonton on August 16, 1929.
regimental number 166384 is the only possibility (I think - LACs stupid search function glitch makes it really hard...), but he should have signed up around here since he homesteaded already.... present address card is wrong... books might be helpful? Jack was born in Cornwall, Ontario on October 3, 1886. At the time of his enlistment in March of 1916, he was living in Pincher Creek, Alberta. Jack received a gunshot wound to his left hand in June of 1917; as a result his ring finger was amputated and lost sensation in the middle finger. While serving overseas, Jack met Alice Louise Frampton. They were married in Wimborne, England on December 1, 1917. Jack was discharged in July of 1918 because of his injury. He and Alice settled in Falher in 1919 and filed on a homestead at 24-76-21-W5. Jack died on May 19, 1947 and was buried in the Veterans' Section of the McLennan Cemetery. Joseph was born in Carlow, Ireland on May 22, 1887. He came to Canada in 1909, and to Grande Prairie in July of 1914 as the Anglican minister. In October of 1915, Joseph enlisted as a chaplain in the Canadian army. Joseph married Amy Dixon in Toronto on April 6, 1916. He served in Salonika (1916-1917, No. 5 Canadian General Hospital) and England (No. 4 Canadian General Hospital). In 1918 Joseph suffered from pleurisy and tuberculosis and was in hospital in England in August. He was recommended for immediate evacuation to Canada because of the tuberculosis and sent home in October of 1918. After the war he ministered in Ontario, though he and his wife returned to visit Grande Prairie in 1940. In August of 1919 Norval returned to Canada. Her father and brothers had come up to Sexsmith during her time overseas, and she joined them here. Here she met and married Gordon McDonald; their land was located at 13-74-5-W6 and 21-74-4-W6. Bob was born in Owen Sound, Ontario on November 9, 1882. In 1917, his service file reports that he was reprimanded for creating a disturbance at his billet after lights out. In January of 1918, Bob was sent to the School of Farmery for cold shoeing (?). He filed on a homestead at E 10-78-24-W5 after the war. Bob died in the McLennan Hospital around 1936; he had climbed a tree while on a trapping trip and fell and broke his back. Roderick was born in Wapella, Saskatchewan on June 28, 1886. He enlisted in Winnipeg in January of 1916. According to his service file, he was living in the Spirit River area in 1921; his land was located at 4-79-5-W6 and 30-80-7-W6. Roderick died in 1973. Wilfred served in the Royal Flying Corps during World War I. According to a letter he wrote in January 1918, he was in training in Camp Borden, Ontario, with plans to continue on to Toronto University in about two weeks' time for an eight week training program and flying school. David was born in Lancaster, Ontario on October 26, 1895. In May of 1918, he enlisted in the Canadian Army Medical Corps; his brothers Ewen and Malcolm served in the army as well. After the war David came to the South Peace region and filed on a homestead at 31-70-11-W6. Ewen was born in Lancaster, Ontario, on April 30, 1892. He came west with his uncle in 1915 and filed on land at 36-70-12-W6 and 23-70-12-W6. In September of 1915, Ewen enlisted in the Canadian army. He was discharged in December of that year and reenlisted as an officer. His brothers David and Malcolm also served in the army during World War I. In 1921, Ewen bought a building north of Halcourt and moved it to Rio Grande - it was Rio Grande's first store. Ewen married Elva Edgar in February of 1923; they had two sons, Charles and Bruce. Ewen died in 1970. Jim was born in Alexandria, Ontario on April 23, 1881. In 1911 he came over the Edson Trail and settled in the Peace Country, eventually owning property at S1/2 28-73-5-W6 and NE 28-18-7-W6. Jim enlisted in the Canadian army in September of 1915. He was wounded in action twice; first gunshot wounds to his hand and leg on October 13, 1916, and a head wound in January of 1918. Not long before he was wounded the first time he had written a letter home stating that his time in France was "quiet." He had been in the trenches three times and said that there was not much going on other than artillery duels and bomb throwing. 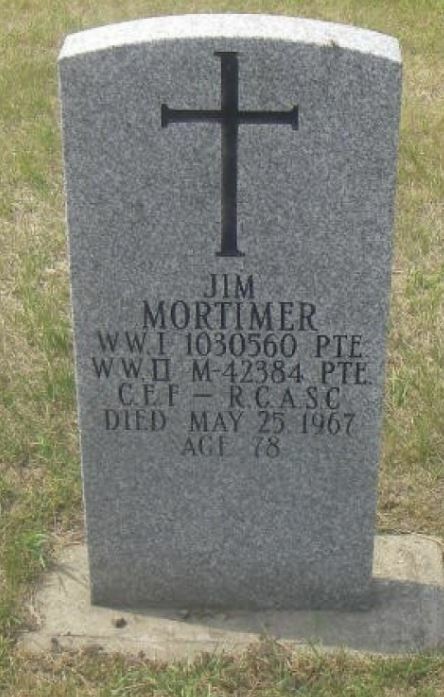 Jim died on January 17, 1947 in Edmonton. Malcolm was born in Lancaster, Ontario on December 28, 1896. In September of 1915, he enlisted in the Canadian army; his brothers Ewen and David also served in the war. In November of 1916, Malcolm was wounded in his left side and left arm. After the war, he filed on a homestead at 31-70-11-W6. Malcolm died on July 21, 1973. John was born in Charlottetown, PEI on March 5, 1885. He listed Davisburg, Alberta as his current address at the time of his enlistment in July of 1916, but he enlisted in Grande Prairie. His homesteads were located at 30-72-2-W6 and 23-72-3-W6. John died at Hill 70 on August 15, 1917. Norman was born in Stornoway, Scotland on March 28, 1883. It is unknown when he came to the Peace country, but at some point he filed on a homestead at 18-74-3-W6, near Teepee Creek. Norman enlisted in the Canadian army in Edmonton in August of 1915. He was killed in action on April 9, 1918 during a raid on trenches northwest of Gavrelle. Clarence was born in Seattle, Washington on May 21, 1896. He was living in Halcourt at the time of his enlistment in June of 1918 (his homestead was located at 7-70-10-W6). Because he was drafted so near the end of the war, Clarence never saw action at the front lines in France, but served only in England. John was born in Charlottetown, PEI on December 16, 1886. At the time of his enlistment in 1916, he gave his address as Spirit River, Alberta. David was born on October 3, 1866 in Fergus, Ontario. He came to the South Peace in April of 1913 and filed on a homestead at 16-73-5-W6; after the war he also filed on land at 8-74-5-W6. When he enlisted in the Canadian army in January of 1915, David gave his date of birth as 1872. He had previously served in the Philippines for two years with the American Volunteer Infantry. In January of 1918, David was transferred to England as he was over 50 years old and not fit for active duty. He was discharged in June of 1918, and returned to the South Peace with his new bride. In 1923, David sold his land and returned to Ontario. He died on January 19, 1924. Frederick was born in Brandon, Manitoba on June 15, 1883. On August 10, 1910 he married May Ridgeway. Fred enlisted in the Canadian army in January of 1916; at this time he and May still farmed in Manitoba. Fred suffered from pleurisy and myalgia throughout the war. After being discharged, Fred and May moved to Saskatchewan where they farmed for nine years. Then, in 1928, they moved up to the South Peace region where they farmed in the Goodfare area for many years. In 1958 they sold the farm and moved into Beaverlodge. Fred died in Edmonton on August 25, 1972. Michael was born in Belfast on May 1, 1884. It is unknown when he came to Canada, but at the time of his enlistment in September of 1915, Mike was living in Grande Prairie; his homestead was located at 31-71-5-W6. He received a gunshot wound to his left thigh in September of 1916, and a shell wound to his right arm in August of 1918. In May of 1919 he returned to the South Peace. Mike was still living in Grande Prairie in 1934 and was known for his deep bass voice. James was born in Aberdeen, Scotland in September of 1893. He came to Spirit River in 1912 or 1913 and filed on a homestead at 35-78-6-W6. In July of 1915 James enlisted in the Canadian army. He was awarded the Military Medal in November of 1917, and was gassed in April of 1918. On June 27, 1921 James married Winifred Humphries in the matron's room of the Grande Prairie Hospital. Winifred was a member of the staff there, and James had been a patient. They had five children. James died in 1937. Vincent was born in Kingston, Ontario on October 22, 1894. It is unknown when he came to the South Peace, but at some point he filed on a homestead at 34-78-6-W6, near Spirit River. Vincent went missing after an attack north of Courcelette on September 27, 1916 and was presumed to have died. Jim was born in Ontario County, Ontario on March 17, 1879. He came to the South Peace in 1914 and filed on NW 19-70-10-W6, at the top of the Red Willow hill. In July of 1915 he enlisted in the Canadian army. He received a gunshot wound to his head and thigh in October of 1916 at the Somme. According to his medical reports, he was anorexic, undernourished, and very weak. In June of 1918, Jim was invalided to Canada and discharged in October of 1918, having been found medically unfit. He died on July 19, 1938. Charles was born in Morden, Manitoba on May 27, 1856 (according to his obituary and headstone; a note on his service file states that his "real" date of birth was in 1866). He fought through the Riel Rebellion with the RCMP in 1885. In 1912 Charles came to the South Peace and filed on a homestead at 31-73-6-W6, though it appears he returned to his family in Manitoba as he enlisted in Morden in 1915, and listed Morden as his present address. Charles lied about his age in order to be accepted. He was married to Jennie (Jane) and had nine children aged 12 to 26 at the time of his enlistment. Though Charles came to live in the South Peace after the war, his wife and children remained Morden. Charles died on December 28, 1939 and was buried in the Emerson Trail Cemetery. George was born in Dunbartonshire, Scotland on October 18, 1871. He came to Canada before the war and was living in Strathcona, Alberta at the time of his enlistment in August of 1916. George served only in England, likely because of his very flat feet. It appears that he worked as a cook in the army. In January of 1919, he married Catherine Nielson. They came to Canada later that year and settled in the Spirit River area (28-77-6-W6; 23-78-5-W6). George died in the Veteran's Hospital in Edmonton on March 21, 1959. Robert was born in Blanchard, North Dakota on August 29, 1892. He came over the Edson Trail in 1913 and the following year filed on homesteads at NE 15-73-10-W6 and SE 21-73-10-W6. In October of 1915 he enlisted in the Canadian army. Bob was wounded in action twice, first shrapnel wounds to his head and back in June of 1917, and later a gunshot wound to his right arm in October of 1918. In twenty-five months in the trenches had only one leave. Bob died in April of 1982. William was born in Dublin, Ireland on December 16, 1895. It in not known when William came to the Peace country, but he was living in Lake Saskatoon at the time of his enlistment in September of 1915. In September of 1916, he received a gunshot wound to his right shoulder. William died on October 26, 1946. John was born in Nitshill, Scotland on April 20, 1887. He came to Canada in 1909 and made his way across the country to Calgary. In April of 1915, John enlisted in the Canadian army. He received gunshot wounds to his right leg on December 16, 1915 at Kemmel. In October 1916, John received a severe gunshot wound to his scalp at Courcelette. Then in 1917, while convalescing, he fractured his right leg in an accident. John was granted permission to marry in July of 1918 and married Nancy Robin in England. They returned to Canada after the war and in 1919 they filed on homesteads at E1/2 36-78-21-W5 and SW 5-79-20-W5. Nancy died in childbirth in 1930, leaving John with eight children. He later remarried to Mary Taylor and had four more children. John died on June 7, 1960. Patrick was born in Tyrone, Ireland on March 17, 1882. At the time of his enlistment, he was living in Calgary. Patrick has two attestation papers, one dated December 1915 and the other September 1916. At some point during this time, Patrick married Florence. Patrick died on April 4, 1936. Alec was born in Lancaster, Ontario on September 4, 1889. He came to the South Peace with his cousin Ewen MacDonell and filed on a homestead at 25-70-12-W6. In May of 1918, Alec enlisted in the Canadian army. As the war was nearly over by this time, he served only in England and did not see active duty in the trenches in France. In 1919, Alec and Ewen came to the Rio Grande area and set up a store. Alec married Viola Bell Ramsay on December 5, 1922. They moved to Lac Du Bonnet, Manitoba. Daniel was born in Inverness, Scotland in 1885. He came to Canada in 1910 and settled in Winnipeg, where he lived for four years. In 1914 Daniel came over the Edson Trail and filed on a homestead in the Beaverlodge area (NE 6-72-10-W6, possibly 31-71-10-W6 as well). He enlisted in Winnipeg and served in the 43rd Battalion Cameron Highlanders. While on leave in Scotland, he married Bella Watson. They returned to Canada after the war. In 1923 Daniel sold out and the family moved to San Francisco. He died on January 5, 1974. John was born in Whitewood, Saskatchewan on March 24, 1896. He enlisted in the Canadian army in August of 1915. In June of 1918, John was invalided to Canada, suffering from impetigo (a highly contagious skin infection) on his legs and arms. He eventually settled in the South Peace and filed on a homestead near Pipestone Creek (30-70-7-W6). His wife's name was Mabel Florence. John died on May 10, 1972. Guy was born in Renfrew, Ontario on March 12, 1890. He filed on a homestead at 9-72-3-W6, east of Kleskun, though it is uncertain when he lived here. Guy went missing in action on September 15, 1916 at Courcelette and was later presumed dead. Sources: homestead records; see Canadian Virtual War Memorial for photo and news clipping. Herb was born on September 22, 1884 in Souris, PEI. He was living in the South Peace at the time of his enlistment in September of 1914; his homesteads were located at 23-72-5-W6 and 24-72-5-W6. Herb was a veteran of the Boer War. In December of 1915 he received gunshot wounds to his face and hands, and shell wounds to his back. Herb was killed in action on June 2, 1916, southeast of Zillebeke, Belgium. Joseph was born in Antigonish, Nova Scotia on August 20, 1888. He was living in Camrose and working as a solicitor at the time of his enlistment in 1916. When he returned from the war, Joseph set up a legal practice in Sexsmith. In November of 1943 he was appointed as judge of the District Court of Northern Alberta. Andrew was born in Avoch, Scotland on May 10, 1885. He was living in Calgary when he signed his Officers' Declaration Paper in December of 1915. On May 3, 1917 at Fresnoy, Andrew received severe gunshot wounds to his right cheek and testicles. As a result of this injury, Andrew also suffered from shell shock, experiencing tremors, loss of memory, exhaustion, nervousness, and other related symptoms. On December 24, 1929, Andrew married Constance Marjorie Wirth. In 1930, he filed on a homestead at SE 8-70-22-W5. He later canceled on this homestead. Andrew took over the Goyne Hotel in Beaverlodge in spring of 1941. 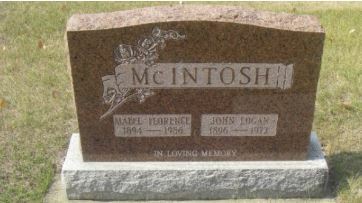 He died on July 23, 1964 in Calgary and was buried in the Burnsland Cemetery. Daniel was born on April 14, 1891 in Indian Brook, Nova Scotia. He was living in Spirit River when he was drafted in January of 1918. Daniel was gassed in September of 1918. Donald was born in Brock, Ontario on November 18, 1870. He enlisted in Fort Frances in January of 1915; according to his service file he served only in England. Donald filed on a homestead at 34-72-12-W6, near Goodfare; it is uncertain when he came to the Peace Country. 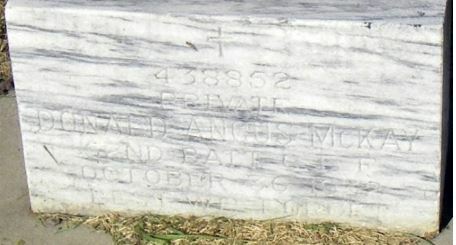 Donald died on October 30, 1932 and was buried in the Grande Prairie Cemetery. William was born in 1893. He served in the British Army during World War I (the L indicates that he would likely have served in either the Royal Navy or the Royal Artillery). He also served in the Veterans Guard of Canada during World War II. 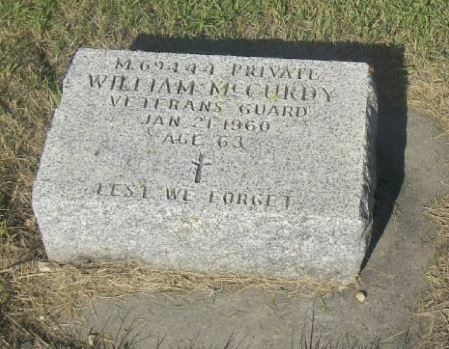 William died in 1968 and was buried in the Grande Prairie Cemetery. Benjamin was born in Winnipeg, Manitoba on March 3, 1877. He came to the South Peace before the war and filed on a homestead at 23-77-6-W6. In September of 1915, Ben enlisted in the Canadian army. He served in France and Belgium. In September of 1916, Ben was gassed and received shrapnel wounds to his face. On August 29, 1917 he received gunshot wounds to his right leg. Ben returned to the South Peace after the war. In the 1940s he retired from farming and he later returned to Winnipeg at his brother's request. Ben died in Winnipeg on April 11, 1964. On November 11, 1919, Cecile married George MacKenzie. They had met at a military hospital in England while George was convalescing. The couple had two children. George enlisted in the Air Force in 1941; Cecile joined him in Ontario where he was stationed. Son Hugh and daughter Virginia both joined the Air Force as well; Hugh was killed in action in 1944. George and Cecile returned to the South Peace after the war. Cecile died in 1954 and was buried in the White Mountain Cemetery. George was born in Hamilton, Ontario on November 9, 1891. He came to the Peace region over the Edson Trail in 1914 and filed on homesteads at 24-77-6-W6 and 19-77-5-W6. George enlisted in the Canadian army in February of 1917 and served for many months as an ambulance bearer in the trenches. On November 11, 1919, George married Cecile McKibben. Cecile had been a nursing sister; they had met at a military hospital in England while George was convalescing. The couple had two children. George enlisted in the Air Force in 1941; Cecile joined him in Ontario where he was stationed. Son Hugh and daughter Virginia both joined the Air Force as well; Hugh was killed in action in 1944. George and Cecile returned to the South Peace after the war. Cecile died in 1954 and was buried in the White Mountain Cemetery. George continued to farm until 1959, then moved to Vancouver to live with his daughter and her family. George died in 1977. Jack was born in Greenwood, Prince Edward Island on August 15, 1880. He filed on a homestead at SE 8-72-3-W6 in 1913. Jack enlisted in the RNWMP in September of 1914, and in the Canadian army in October of 1915. In September of 1916, Jack received a gunshot wound to his right leg at Courcelette. He was invalided to Canada and discharged in September of 1917. Jack returned to Bezanzon and sold his original homestead. He purchased another at SE 33-71-3-W6 and built a store on this property. Jack married; he and his wife had one daughter, Phyllis, who was born on October 1, 1921. Jack died on May 11, 1948. John filed on SE 8-71-3-W6 in 1914. He enlisted in the RNWMP in September of 1914, and presumably joined the Canadian army later. In 1919 he filed on a soldier's grant at SW 21-71-3-W6. John left the area in 1923. Murray was born in St. Catherines, Ontario on July 18, 1895. At the time of his enlistment in the Canadian army in summer of 1918, Murray was living in Spirit River. His homestead was located at 19-77-5-W6. Clarence was born in Sault Ste. Marie, Michigan on April 6, 1893. At the time of his enlistment he was living in Suffield, Alberta. While serving overseas he met an Englishwoman named Ivy; they were married in 1919. It is unknown when Clarence came to the Peace country, but he eventually settled on 26-74-2-W6 and 27-74-2-W6. Clarence died in February of 1970. Jack was born in Orangedale, Nova Scotia on August 1, 1896. He enlisted in Sydney, Nova Scotia of March 1916. Jack was discharged on December 25, 1918, having been deemed medically unfit (according to his obituary he had been gassed in 1917). He married Theresa Davis in 1921. In 1927 Jack, Theresa, and their daughter Shirley came to Sexsmith; he filed on SW 6-74-5-W6. Jack died in Sexsmith on November 29, 1935. Neil was born in Reserve Mines, Nova Scotia on February 18, 1890. He enlisted in Glace Bay, Nova Scotia in March of 1916 and served on the front lines in France and Belgium. Neil filed on 16-74-14-W6 in the 1920s. He died on November 4, 1931. Ross was born in New Brunswick. He settled in the Sexsmith area (30-73-2-W6) in 1928 with his wife Hilda and son Arthur. Theresa was born in Eardley, Quebec on May 12, 1882. She enlisted as a nurse in the Canadian Medical Corps in April of 1916 and served in France and England. In 1921, Theresa married James McKinnon; the couple and their daughter Shirley came to Sexsmith in 1927. They settled on SW 6-74-5-W6. Theresa died on December 19, 1943. Peter was born in Perth, Ontario on July 9, 1871. It is unknown when he came to the Peace country, but he enlisted in Grande Prairie in September of 1915. His homestead was located at 21-72-3-W6. Peter died on March 27, 1941. Archie was born in Taynuilt, Scotland on October 25, 1884. Some time before 1914, he settled in Texas and worked on a dairy farm. Shortly after the outbreak of World War I he went to Windsor, Ontario, where he enlisted in February of 1916. In March of 1917, Archie was in hospital for gas poisoning. He said that loud noises made him dizzy. Archie was awarded the Military Medal in June of 1919. After the war, he came to the East Smoky area and settled on SW 16-72-1-W6 and NW 9-72-1-W6. Archie farmed this land for forty-six years. Archie died on May 10, 1969. Daniel was born on December 31, 1895 in Gem, Idaho. By the time he was drafted in the summer of 1918, Daniel was living in Spirit River. His land was located at 25-77-6-W6 and 36-77-8-W6. Daniel died of influenza in England on December 17, 1918. Nelson was born in Charlottetown, PEI on June 26, 1896. He settled in Bezanson after World War I. Nelson married Blanche Moody on June 15, 1927; the couple had four children. During World War II Nelson served with the Army Training Centre and Veterans' Guard in Grande Prairie. He died in February of 1982. Arthur was born in Seaforth, Ontario on April 29, 1881. He worked in Grande Prairie as a land agent, having been transferred here in 1910. Arthur traveled to Ontario to enlist in the Canadian army in October of 1915. He received gunshot wounds to his right knee in September of 1916. On August 15, 1917, during an attack at Hill 70, Arthur received severe shrapnel wounds to his abdomen. He died of these wounds the same day at the No. 2 Canadian Field Ambulance. A memorial service was held in Grande Prairie in September of 1917. Donald was born in Bruce County, Ontario. He filed on a homestead at 30-78-6-W6. Donald died in November/December 1935 at the age of 61. John was born in Belleville, Ontario on February 5, 1879. 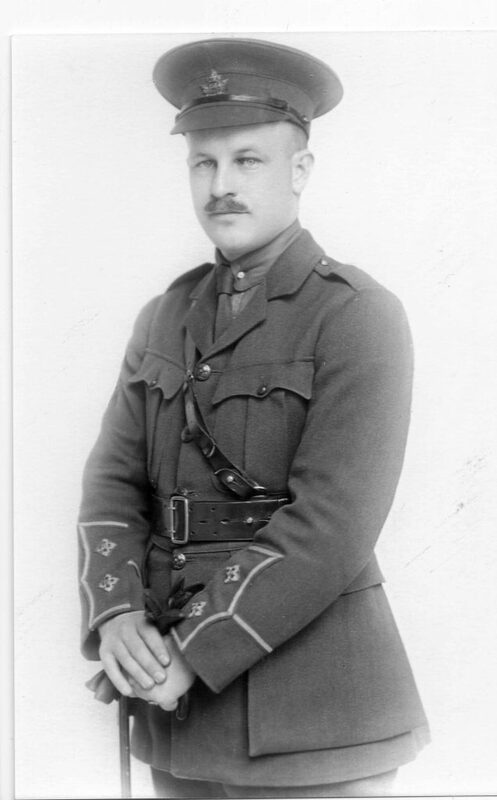 He enlisted in Calgary in November of 1914 and served in England, France, Canada, Washington DC, and Siberia. After the war John settled in the South Peace. He married Vera in July of 1934; they were divorced in January of 1945. Billie was born in Big Glace Bay, Nova Scotia on November 3, 1890. She enlisted in 1917 and served in France as a nurse. While stationed at the No. 2 Canadian Stationary Hospital in France (Le Touquet or Outreau) in August of 1918, Billie suffered from food poisoning. She was sent back to England to serve in hospitals there as a result of multiple medical problems. In 1921, she and several other nurses came to the South Peace and filed on a homestead at 12-79-26-W5. This land was occupied by the nurses until 1928. George was born on Manitoulin Island in 1872. He and his wife Molly (Eleanor Mary O'Hullahan) and their two children, Jack (6 months) and Alene (2), came to the Bad Heart area in 1921 and settled on 9-75-2-W6 and 20-75-2-W6. George and Molly had three more children, Roderick, Allan, and Alexander. George died on July 3, 1944. Henry was born in Edmonton, Alberta on February 11, 1897. By the time he was drafted in 1918, Henry was living in Spirit River (7-79-5-W6). Because he was drafted so near the end of the war, he served only in England. John was born in Dromore, PEI on January 16, 1880. He was married to Annie Graham at the time of his enlistment in July of 1916, and they were living in Edmonton. After the war John worked as a Field Supervisor of the Soldier Settlement Board; he was transferred to the Grande Prairie area in 1925 and stayed until 1934. His homestead was located at 26-83-25-W5. John died in Edmonton on September 3, 1934. John was born on April 30, 1888 in Charlottetown, PEI. He was living in Grande Prairie at the time of his enlistment in March of 1916. In March of 1917, John was seriously ill with pneumonia. He died of gunshot wounds to his left thigh at Passchendaele on November 12, 1917. John's grave marker is inscribed with "Faithful unto death." Ewen was born in Meaford, Ontario on September 21, 1887. It is unknown when he came to the Peace Country, but he filed on a homestead at 21-74-9-W6, near La Glace. Ewen was killed in action northwest of Courcelette on October 8, 1916. Peter was born on October 26, 1892 (according to the community book, October 18, 1882 according to his headstone) England. After serving in the British Army during World War I, he came to Canada. Mary Jane Studholme joined him later and they were married. They lived in Saskatchewan until 1929, then came west to Grande Prairie. Peter served in the Veterans' Guard during World War II. He died on December 23, 1972. Frederick was born in Killarney, Manitoba on June 9, 1893. He enlisted in the Canadian Army in March of 1916. Frederick died in November of 1956 and was buried in the Grande Prairie Cemetery. John was born in Brant County, Ontario on January 13, 1889. He studied education at the University of Toronto. In July of 1916, John joined the Canadian Army. He served in France and Belgium and was gassed in 1918. After the war, John settled in the Beaverlodge area (36-70-11-W6; 19-71-10-W6; 28-70-11-W6), joining his parents and sisters who had come prior to the war. John taught at Lake Saskatoon and Beaverlodge High School, but only for a short time. Due to the effects of the gas, outside work proved to be better for his health. In 1959, John married Noel Cameron from New Zealand. John died in March of 1970. Amy was born in Cornwall, Ontario on August 5, 1886. She enlisted as a nurse in the Canadian army in 1917. Amy went to the No. 2 Canadian Stationary Hospital upon arrival in France and served there from July 1918 until March 1919 (Le Touquet or Outreau, France). In 1921, she and several other nurses came to the South Peace and filed on a homestead at 12-79-26-W5 (Amy also filed on ?-78-5-W6). This land was occupied by the nurses until 1928. Donald was born in Crathie, Aberdeenshire, Scotland on July 10, 1883. He came to the Grande Prairie area in 1910 and filed on a homestead at 33-72-5-W6. Donald enlisted in the Canadian Army in November of 1915. In June of 1917, he received a shrapnel wound to his right arm. After the war, Donald returned to his homestead and a few years later married Mary Edemson. They retired to Nanaimo, BC in 1945, where Donald died in April of 1964. Albert was born in Newdale, Manitoba on January 5, 1895. His father, recently a widower, brought his young family to the Manola district of Alberta in the mid 1890s. Albert enlisted in the Canadian army in April of 1916 and served in France and Belgium. In 1920, he and his brother Fred settled in the East Kleskun district. Albert was killed in an accident in Fort Smith (possibly in the early 1930s). Fred was born in Newdale, Manitoba on October 8, 1895. His father, recently a widower, brought his young family to the Manola district of Alberta in the mid 1890s. Fred enlisted in the Canadian army in May of 1916. In 1920, he and his brother Albert came to the South Peace. Fred's homestead was located at 33-73-25-W5. 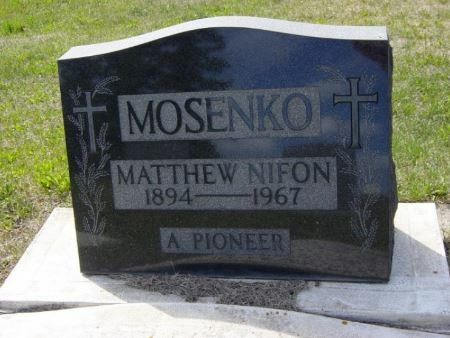 He died on February 28, 1958 and was buried at Gibbons, Alberta. Wilfred was born in Eastleach, Gloucestershire, England on December 20, 1883. He was living in Winnipeg at the time of his enlistment in January of 1916. According to his service file, Wilfred was wounded in the upper right arm on April 9, 1917 at Vimy Ridge. At some point he came to the South Peace and filed on a homestead at 19-69-10-W6. Wilfred died on August 16, 1927. Harry was born in Belfast, Ireland on May 6, 1892. He came to Canada around 1913 and filed on a homestead at 21-71-8-W6. In October of 1916 he was slightly wounded, but he remained on duty. Harry was killed near Inchy-en-Artois on September 27, 1918. An enemy shell exploded on the parados while he was in the trench being served his rations and he was killed instantly. Harry's grave marker is inscribed with "Gone before." Emil was born in St. Didace, Quebec on September 5, 1885. He came to Alberta in 1912 and filed on homesteads at 7-78-21-W5 and 2-77-22-W5 (near Falher) in 1915. Emil was drafted in July of 1918. He married Aldea Belanger in New Hampshire, and in 1921 they returned to farm in Falher. They had four children. Emil died in McLennan on January 29, 1962. Jack was born on June 14, 1896 (1897?) in London, England. He joined the Canadian army at Valcartier in September of 1914. On March 13, 1915 during the Battle of Fromelles, Jack received gunshot wounds to his head and neck. Both eyes were scraped to remove shrapnel, but some was left behind in the right eye because it was too dangerous to remove. Jack lost the vision in his left eye, and could not raise his right eye upward. He was discharged in July of 1915. On December 19, 1925, Jack married Anna Dolemo. They lived in Grande Prairie and owned property at 24-73-10-W6; 23-73-10-W6. Jack died on July 19, 1968 and was buried in Dawson Creek. Alfred was born in Hammersmith, England on July 19, 1892. He settled in the South Peace in 1910; his homesteads were located at 5-72-4-W6 and 25-71-6-W6. According to his service file, Alfred married Alice Elizabeth on September 1, 1916. A Grande Prairie newspaper clipping states that on October 27, 1926, he married Katherine Elizabeth Graham. What happened to Alice is unknown. Alfred moved to the west coast around 1944 and died in Victoria on January 11, 1953. Sources: Pioneers of the Peace p. 189; HT January 15, 1953. Sydney was born on July 8, 1890 in Derby, England. At some point he filed on a homestead at SW9-79-13-W6. Sidney enlisted in Port Arthur, Ontario in May of 1915. During his time overseas, he married a woman named Jane who was living in Ireland. Sydney died of gunshot wounds to his left thigh on June 28, 1917 at the No. 22 Casualty Clearing Station (Bruay). His graver marker is inscribed with "He died that we might live." James "Scotty" Marshall was born in Glasgow, Scotland on January 2, 1887. At the time of his enlistment in September of 1915, he was married with three children and working as a barber in Montreal. Scotty filed on his homesteads at 24-74-4-W6 and 23-74-4-W6 after the war in 1919 and got the title in 1928. His wife, Catherine, went back east with their children. Scotty farmed his land for twenty years. At that time he became ill and Catherine returned to get him, but he died on June 15, 1943 in a Winnipeg hospital before they were able to reach their home in Montreal. Eddy was born on July 5, 1887 in Windsor, England. He came to Canada in 1904, and to the South Peace six years later. In September of 1915, Eddy enlisted in the Canadian army. At this time he was already married to a woman named Louisa Ellen. During the Battle of Mouquet Farm in September of 1916, Eddy received gunshot wounds to his hip and leg, and also had a shell concussion. Eddy died on September 16, 1968. George was born in Barton-le-Clay, Bedfordshire, England on July 2, 1892. At the age of 15 he came to Canada. He joined the Canadian Bank of Commerce and in 1913 was posted to Lake Saskatoon; he later filed on a homestead at 15-71-10-W6. In July of 1915, George enlisted in the Canadian army. On December 30, 1915 while back in Grande Prairie during a leave of absence, he married Jane Marion McNaught. In December of 1916, Marion sailed to England where she worked in a munitions factory. George received gunshot wounds to his right shoulder on November 10, 1917. On August 8, 1918, he was awarded the Military medal at Amiens. George and Marion returned to Lake Saskatoon in 1921. They lived in Edmonton from 1949 until 1952, while George managed a bank there. After his retirement, they returned to Grande Prairie. George died in March of 1978. Oliver was born in St. Esprit, Quebec on April 1, 1885. He enlisted in the Canadian Army in September of 1915. Oliver received gunshot wounds to his right side in September of 1916 but returned safely after the war and filed on a homestead at 32-77-21-W5. Oliver died on January 27, 1950. Charles was born in Brandon, Manitoba on October 18, 1888. In 1912 he filed on a homestead at 5-72-7-W6. Charles enlisted in the Canadian Army in September of 1915 and returned to his homestead in Lake Saskatoon after the war. On December 20, 1930, he married a woman named Mona whom he met while working as a ranger in Jasper National Park. The couple eventually moved to Hinton. John was born in Donegal, Ireland on October 26, 1888. He filed on a homestead at NE9-72-3-W6 in October of 1915, and a few months later in May of 1916 enlisted in the Canadian army. In May of 1918, John received gunshot wounds to his left hip and was in hospital until July. He was wounded a second time on October 8, 1918, this time shrapnel wounds in his back. John died that day at No. 22 Casualty Clearing Station, at that point located at or near Pernes, France. Herbert was born in Thomson, Nova Scotia on July 26, 1894. He filed on a homestead at NE5-72-4-W6 in June of 1915. In July of 1918, Herbert was drafted. He returned to the area after the war and filed on a second homestead at 17-71-2-W6 in 1920. Herbert married Gertrude Bezanson in the McQueen Presbyterian Church on June 18, 1919. Frank was born in Marston St. Lawrence, England on September 10, 1893. He was living in Duff, Saskatchewan at the time of his enlistment in March of 1916. After being discharged from the army, Frank came to the South Peace and filed on the eastern half of 32-78-20-W5. Clement "Jim" Mead was born in Balcombe, Sussex, England on July 25, 1880. He came to the South Peace in 1905; his filed on the following homesteads: 32-72-7-W6; 7-72-7-W6; 16-71-2-W6; 21-71-2-W6; 12-72-8-W6; 7-72-7-W6. In 1913, Jim married Kate Thompson. They had a daughter named Kathleen, born on March 14, 1915. Prior to serving in World War I, Jim had served in the Boer War. He secured a commission as a lieutenant in the 66th Battalion and was placed in command of the Grande Prairie contingent. In September of 1916 Jim was wounded in the foot. In August of 1917, he was awarded the Military Cross for "conspicuous gallantry and devotion to duty when on command of a raiding company. He led his men with greatest courage and aggressiveness, reorganizing them in spite of severe casualties, and very largely contributes to the success of the raid." Jim was wounded a second time in October of 1917, this time receiving severe gunshot wounds to the face. He was killed in action in the trenches west of Lens on January 18, 1918. Harry was born in Portsmouth, England on March 14, 1887. He came to Canada in 1907 and worked in Osage for some time. Later he went to Winnipeg, where he was living at the time of his enlistment in February of 1916. While serving in England, Harry renewed his acquaintance with an old friend, Madeline Irene Margaret, and they were married on August 26, 1916. At the end of the war, Harry and Madge and their one year old daughter Paddy settled in Canada. They filed on a homestead at 22-76-3-W6, north of Kakut Creek. In 1949, they sold their property and moved to White Rock, BC to be nearer to Paddy. John was born in Londonderry, Ireland on October 15, 1894. He enlisted in the Canadian army in Calgary in March of 1915. In June of 1916, John was wounded at Mount Sorrel. In September of that year, he received severe shrapnel wounds to his face, arms, and neck at Courcelette. John was killed northwest of Neuville Vitasse on June 25, 1918 when a bomb exploded on his chest. His grave marker is inscribed with "Until the day breaks." Robert was born in Guelph, Ontario on March 12, 1871. He filed on a homestead at 2-74-6-W6 in June of 1915. According to his attestation paper, dated January 20, 1916, Robert was a widower. He had a son Harry who was in care of F.W. Ismond in Belcarres, Saskatchewan. Robert died on October 26, 1917 at Bellevue Spur, Passchendaele. Zotique was born in Glen Sandfield on August 14, 1894. He settled in the South Peace in 1914 and filed on homesteads at 7-72-2-W6 and 24-72-3-W6. In March of 1916, Zotique enlisted in the Canadian army. He suffered from synovitis in his right knee, caused by jumping over trenches in France. Zotique married Margaret Chubeu in 1922; the couple had one child, a son named Paul. Zotique died in December 1984/January 1985. Joseph was born in Bellechasse, Quebec on December 8, 1891. He filed on a homestead at 36-76-22-W5 in April of 1914. In 1915 he enlisted in the Canadian army. Joseph died of wounds on September 23, 1916. He was proceeding with his company to the front line at Courcelette and was severely wounded by shrapnel in the legs and back. He was taken to the No. 9 Canadian Field Ambulance and given immediate attention, but died the same day. Percy was born in Blackville, New Brunswick on March 16, 1887. He filed on a homestead at 14-72-10-W6 in October of 1912. In September of 1915, Percy enlisted in the Canadian army. He was killed in action west of Courcelette on September 26, 1916. Foster was born in Bristol, England on June 21, 1882. He settled on a homestead at SW 2-77-22-W5, though he never farmed himself. Foster enlisted in the Canadian army, but was discharged a couple months later as he was "not likely to become and efficient soldier." He died at the age of 85 and was buried in Rocky Mountain House. Albert was born in Kelvin, Ontario on December 20, 1896. He came to the South Peace with his parents in 1909 and eventually filed on homesteads of his own at 25-71-10-W6 and 4-72-10-W6. Because he was drafted so near the end of the war, Albert served only in England. He married Euphemia Kinnear Hope on September 21, 1934. Albert died in November of 1967. Albert was born in New York City on February 22, 1884. He was living in Spirit River (0-78-5-W6) when he was drafted in 1918. Because he was drafted so near the end of the war, Albert served only in Canada. Albert married Ethel Dobell on June 30, 1933. Chester was born on October 10, 1890 in South Bend, Indiana. He filed on a homestead at SW 17-71-5-W6 in 1913. In 1914, Chester and four other men from the South Peace enlisted in the RNWMP. He left the force to enlist in the Canadian army during World War I (his brother Howard also served in the army). In 1920, Chester married Delia Obenlock; the couple had nine children. Chester died on January 16, 1969 and was buried in the Grande Prairie Cemetery. Edward "Scotty" Miller was born on April 18, 1890 in Thurso, Scotland. In 1912 he came to Canada; he lived in Darlingford, Manitoba for a year, then moved on to Swift Current. Scotty enlisted in the Canadian army in Winnipeg at the beginning of the war, in December of 1914. In August of 1917 he was granted permission to marry Margaret Watt, who had also grown up in Thurso. In November of that year, Scotty received shrapnel wounds to his back and face. He came to the South Peace in April 191 and filed on homesteads at 9-70-11-W6 and 16-70-11-W6. Margaret, their two-year-old daughter Bessie, and Margaret's brother George arrived in September of 1920. The couple had six children. Scotty died on August 2, 1981. Howard was born in South Bend, Indiana on January 4, 1887. He came to Canada in 1910 and came as far as Edson. In 1914, he came to the South Peace and filed on a homestead at SW 18-71-5-W6. Howard enlisted in the Canadian army in January of 1917 (his brother Chester was already serving overseas). He received gunshot wounds to the head in October of 1917. Howard was granted permission to marry Margaret McLain in February of 1919. They returned to the South Peace later that year, after visiting Howard's family in Indiana. In the 1930s Howard was badly injured while riding horseback and had to rent his land out for several years. Howard died on May 3, 1963 and was buried in the Grande Prairie cemetery. James was born in Owen Sound, Ontario on August 31, 1875. He came to the South Peace in 1915 and filed on a homestead at NE 32-73-8-W6. James was married to Jane at the time of his enlistment in January of 1916 and they had six children; according to the address on his service file, Jane was still living in Ontario. James served only in England. He was discharged, having been found physically unfit, in January of 1918. James died on January 30, 1951. Jack was born in Armstrong Corner, New Brunswick on April 6, 1896. He enlisted in the Canadian army in St. John in January of 1916. Jack received gunshot wounds to his back, face, and legs on November 19, 1917 at Passchendaele. He was dangerously ill for about a month before he began to improve and still had limited movement in his legs when he was invalided to Canada in June of 1918. Jack filed on homesteads at 26-71-1-W6 and 35-71-1-W6 in 1919. On April 8, 1925, Jack married Hilda Moon of Bezanson. The couple had four children. In 1941, Jack joined the Veteran's Guard and served at the Sarcee Base in southern Alberta until 1943. Hilda died in 1960, and in 1965 Jack moved back to New Brunswick and married Mrs. Beatrice Clarke. Anton was born on May 4, 1890 in Kristiansund, Nordmore, Norway. He came to the United States as a young man and attended Spokane College from 1912 to 1917, training to be a teacher. Anton was teaching in Montana when he enlisted in the American army in 1917. On October 4, 1918, Anton was wounded and spent the remainder of that year in hospital. He was discharged from the army May 17, 1919. In 1921, Anton moved to the Peace River country and took up a homestead in the Bad Heart district. Anton worked for farmers in the district including the Carveth family while trying to build up his own homestead. On April 27, 1927, he married Jane Broughall Stubbs who passed away nine years later from a heart condition. He then married Anna Smichura in July 22, 1938; they had seven children. Anton died on October 23, 1959. Peter was born in Aberdeen, Scotland on April 24, 1893. In February of 1916, he filed on a homestead at SW 18-70-10-W6. He enlisted in the Canadian army in March of that year. Peter was killed in action at Hill 70, west of Lens, on August 21, 1917. He was buried in Lievin, 1.25 miles southwest of Lens. Eudger was born in Sandon, BC on April 26, 1898 (though according to his service file, he had lied about his age and would have been born ca. 1900). He was living in Grande Prairie at the time of his enlistment in July of 1916. Eudger was discharged on February 5, 1917 as he was underage and had poor feet. Gordon was born in Perth, Ontario on March 5, 1897. He came with his family to Clairmont in 1916. In 1917, Gordon was drafted into the Canadian army (his sister Norval was serving as a Nursing Sister with the Canadian Army Medical Corps). He served only in England. Gordon came down with influenza and myalgia in November of 1918 and was sent back to Canada. By July of 1919, he was in a hospital in Edmonton. Gordon died ca. 1977. Robert was born in Southampton, Hampshire, England on June 20, 1899. He was living in Vegreville at the time of his enlistment in April of 1917; he was slightly underage but was accepted nevertheless. In March of 1918, Robert joined the Royal Flying Corps. After his discharge in 1919, Robert came to the South Peace and filed on a homestead at SW 17-72-2-W6. Alfred was born in Orillia, Ontario on February 18, 1896. He was living in Glen Leslie when he was drafted in the summer of 1918. Because he joined the army so late in the war, Alfred only served in England. In November of 1924, Alfred married Myrtle Wales. Their land was located at NE 31-71-3-W6 and 20-71-3-W6. Alfred died in January of 1989. Andrew was born in Cypress Hills, Alberta on March 20, 1899. He was living in Medicine Hat at the time of his enlistment in February of 1916; he served only in England. Andrew and his brother Edward came to the South Peace in 1921; Andrew filed on the eastern half of 23-70-12-W6. He never married. Andrew died on May 7, 1979. Edward was born in South Dakota on November 14, 1893. At the time of his enlistment in January of 1915, he was living in Medicine Hat. Edward received shrapnel wounds to the back on August 14, 1916 (during the Somme Offensive). He was awarded the Military Medal, as well as the Meritorious Service Medal at Amiens on August 26, 1918. In 1921 Edward and his brother Andrew settled in the South Peace, Edward filed on NW 24-70-13-W6. He died in Grande Prairie on September 23, 1988. Gustave was born in St. Damase, Quebec on April 5, 1896. He filed on homesteads at 21-77-20-W5, 22-77-20-W5, and 28-77-20-W5 in 1917. Gustave was drafted in 1918 and served only in Canada; he returned to Donnelly after the war. In 1920, Gustave was married. He never proved up his land and instead returned to Quebec. Raoul was born in Saint-Aime, Quebec on June 24, 1897. He filed on a homestead at NE 28-77-20-W5 in 1917, by proxy (his brother Gustave filed on his behalf). Raoul was drafted in May of 1918 and served in France. In 1919 he came to settle on his land, then left in 1927. Andrew was born in County Armagh in Northern Ireland in 1884. At the age of 16 he ran away to join the British Army; he served in South Africa and in northern India. During World War I, his regiment was sent to Europe. He was one of the survivors of the retreat from Mons. Andrew was wounded in 1915 and returned to Britain. Here he met Rachel Hall, whom he married in 1917. Andrew and Rachel moved to Canada in 1929 and filed on homesteads at SE19-79-11-W6 and SW20-79-11-W6. Andrew died suddenly in 1940. Frank was born in Fairfax, Minnesota on June 14, 1894. He filed on his first homestead in the South Peace (SW 25-77-6-W6) in 1914. In January of 1915, he enlisted in the Canadian army. Frank received gunshot wounds to his right eye and right leg at the Somme in November of 1916 and was dangerously ill for some time. In November of 1917 he was discharged, having been found medically unfit. In 1919, Frank filed on a homestead at SW 19-77-5-W6; he abandoned this as there was "too much bush." Finally he settled on 26-77-5-W6. In May of 1925, Frank married Gladys Rappel; the couple had four children. Frank died on June 15, 1977. Frederick was born in Indiana on October 15, 1885. At the start of World War I he was in the American standing army. He was anxious to see active duty, so he deserted and crossed the border into Canada, where he enlisted in the Canadian Army at Winnipeg in October of 1917. After the war Frederick came to the DeBolt district and filed on several different land locations; however, since he was more interested in trapping, he never farmed or proved up his land. Frederick died out at his cabin on the Simonette Hill on June 8, 1940. Axel was born in Norway on July 25, 1882. He came to Pekin, North Dakota with his parents at the age of four in 1996. After completing his training as a steam engineer, Axel moved to Saskatchewan and worked with a steam threshing outfit. He enlisted in the Canadian Army in September of 1914. In May of 1915, he received a gunshot wound to his left hand. In February of 1919, Axel married Anne Leslie in Scotland. Later that year they emigrated to Clairmont, where his sister Jennie (married to Tom Sheehan) was living. Axel and Annie settled on NW16-72-5-W6; they had three children. Axel died in Grande Prairie on March 19, 1961. William was born in Southwest Harbour, Maine on October 3, 1893. In 1915, he filed on a homestead in the Kleskun Hill district (SW6-73-3-W6) where he was living when he was drafted in November of 1917. William went overseas and served in France. On November 8, 1918, he injured his left knee on the steps of his billet. William returned to Kleskun Hill after the war and filed on SW5-73-3-W6 in 1919. Gordon was born in Pipestone, Manitoba on April 14, 1896. He was working there as a clerk when he enlisted in the Canadian Army in July of 1916. Gordon was gassed (mustard gas) in September of 1917 but recovered from this exposure. After the war Gordon made his way back to Pipestone and spent some time with his family. His brother Alex had settled in the Morinville area and Gordon farmed with him. In 1929 Gordon filed on 26-87-9-W6, in the Worsley area. By that time he had moved to Grande Prairie and worked as a truck driver. Gordon never married. He died on October 17, 1976 in Dawson Creek. George was born on April 15, 1894 in Netherhill, Saskatchewan. In 1916, he filed on a homestead at 34-71-2-W6. George enlisted in the Canadian Army in May of 1917. He went missing at Passchendaele and was later reported as being killed in action on October 30, 1917. James was born in Minden, Ontario on September 10, 1888. He was living in Carbon, Alberta at the time of his enlistment in January of 1917. James received shrapnel wounds to his right arm in October of 1918. He came to the Grande Prairie area in the mid 1920s and filed on homesteads at SE33-73-10-W6 (which he abandoned soon afterward), NW13-71-5-W6, and SW24-71-5-W6. James served in World War II. He died on May 25, 1967. John was born in Castlefin, Ireland on July 8, 1889. He sailed to Canada in 1910 with his older brother. When he was drafted in March of 1918, John was living in Shoal Creek, Alberta. After the war, he came to the Broncho Creek area and filed on a homestead at 1-79-5-W6. On March 12, 1935, John married Elsie Wherrell. The couple had two children. John died on March 7, 1973 and was buried in the Spirit River cemetery. Matthew was born in Kiev, Ukraine (then Russia) on July 6, 1894. He came to North Dakota with his family in 1903. In 1913, Matthew came to the South Peace and settled on NE 33-73-6-W6 and NW 28-74-6-W6. He was drafted into the Canadian army in 1918. After being discharged, Matthew went to see his family in North Dakota. During his stay there he met Nellie Demchuk; they were married in April 1923. They settled in the Sexsmith area after their marriage and raised three children. Matthew died in September of 1967. Harry was born in Monmouthshire, England on January 23, 1891. He was living in Kisbey, Saskatchewan at the time of his enlistment in August of 1916. In August of 1918, Harry married an Englishwoman named Margaret. He brought his young bride to his homestead in Saskatchewan, where their daughter was born. In 1923, Margaret and their daughter returned to England as farm life was difficult and his wife was ill and homesick. Harry planned to send for them once he got established. He came to the South Peace in 1928, and in 1930 filed on the northern half of 22-76-1-W6. Harry was reluctant to send for his family, as conditions were still primitive and the nearest school for his daughter was twelve miles away. In 1935, another man with the surname Moss was killed in central Alberta. Harry's brother and wife in England heard of it and assumed it was Harry, so they stopped writing. Harry was unaware of this and, as Harry was not much of a writer, he lost contact with his family in England. Some years later, an inquiry for Henry J. Moss was printed in the Legionaire (a magazine for war veterans), saying that a daughter was interested in his whereabouts. Harry replied to the inquirer and found that it was indeed his daughter, who was married and living in southern Alberta. Harry's daughter traveled to Wanham to meet her father. Several years later, when he retired from farming, Harry moved to southern Alberta to be nearer his daughter and four grandchildren. Oliver was born in Washago, Ontario on October 17, 1894. He was living in Hanna, Alberta when he was drafted in January of 1919. His brother William also served. In March of 1919, he forfeited a week's pay for improperly saluting an officer. In 1920, Oliver filed on homesteads at SW 4-72-12-W6 and SW 17-72-12-W6, though according to the present address card in his service file, he was living in Saskatchewan in 1922. William was born in Orillia, Ontario on November 22, 1891. In 1917, he filed on SE 4-72-9-W6 in the Lake Saskatoon area; he later built and operated a blacksmith shop. William served in England during the war, and his brother Oliver served in the Canadian Army as well. 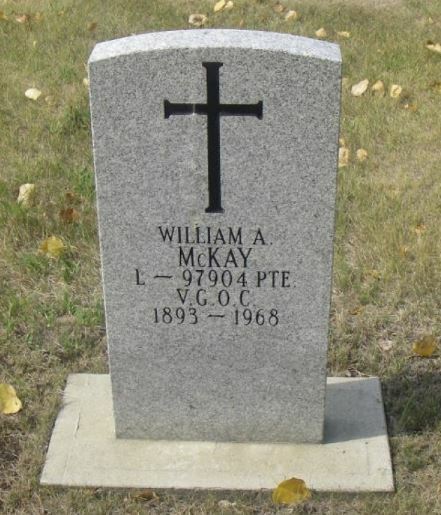 From May until August of 1919, William was with the Canadian War Graves Detachment. On January 3, 1934, William married Margaret Russell. They sold out and left the area in 1939. William died in Langley, BC, on October 9, 1974. Harold was born on April 26, 1896 in Fitch Bay, Quebec. He enlisted in the Canadian Army of January of 1916. Harold came to the South Peace in 1929 and filed on a homestead at NW 31-77-25-W5, near Eaglesham. When World War II brokee out, he enlisted once again. After the war, he returned to farming for another ten years before selling his land and moving to Lac La Biche. Harold died in October of 1986. Gordon was born in Breslau, Ontario on September 25, 1894. He came to the Elmworth area in 1915 and filed on NE 15-70-11-W6 and 14-70-11-W6. In September of that year, he and two of his neighbors, Hubert and Harry Black, walked to Grande Prairie to enlist. Harry was accepted, but Hubert was turned down for being too slender and Gordon for having flat feet - ironic, as he had just walked forty miles to enlist. He was later drafted in May of 1918, then struck off strength on September 14, 1918. On August 31, 1929, Gordon married Edna Small. He died of a heart attack in Elmworth on May 23, 1953. Lincoln was born in Breslau, Ontario on November 28, 1882. In 1916, he filed on a homestead at SE 35-70-12-W6. Lincoln appears to have been related to Gordon Moyer, as they were born in the same town and he appointed Simon Moyer (Gordon's father) as executor of his will. He died of shrapnel wounds to his legs, hand, and thigh on August 18, 1917 at the No. 6 Casualty Clearing Station at Bruay. John was born in Romania on February 2, 1884. He was living in Grande Prairie when he enlisted in March of 1916. On September 20 of that year, he was struck off strength for desertion. Robert was born in the state of Washington on November 29, 1891. In 1917 he filed on a homestead at NE17-74-2-W6. Robert was drafted in January of 1918, and was killed in action on September 28, 1918 in an attack northeast of Haynecourt. His grave marker is inscribed with "Beloved in life lamented in death." See the Canadian Virtual War Memorial for photographs of Robert. James was born in Evanton, Scotland on August 29, 1888. In 1908 he emigrated to the United States, where he worked for his uncles until war broke out. James then crossed the border into Canada and enlisted in Saskatoon in October of 1914. After the war, he came to the Peace River area, filing on homesteads at NW 19-76-3-W6; S 1/2 30-76-2-W6; and W 1/2 15-76-3-W6. James served in the Veterans Guard of Canada during World War II. In 1944, he married a woman he had known in the United States many years ago. They had one daughter. Pat was born on November 19, 1879. In 1910 he filed on NW 19-72-7-W6. He joined the navy during World War I and served on a mine sweeper out of Halifax. Pat died in Red Deer in March of 1955. William was born in Killmaddy, Ireland in 1888. He married Ethel Mae Collins on March 6, 1918; the couple had four sons and two daughters. 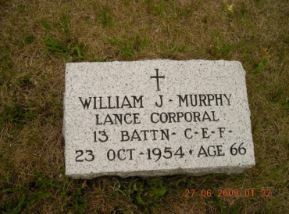 William died on October 23, 1954 and was buried in the Lake Saskatoon cemetery. John was born in Ightham, Kent, England on June 5, 1897. He was farming in Saskatchewan when he enlisted in June of 1915. In January of 1917, John was wounded by a shell exploding. He suffered from shell shock and had difficulty speaking. Because of his injuries, John was discharged in April of 1918. On December 25, 1919, John married Agnes Kilgour. In 1929, the Murrays came to the South Peace and settled on the north half of 21-70-7-W6. They had four daughters and a son. During World War II, John once again served in the Canadian Army. He died on January 31, 1978. Kenneth was born in Woodstock, Ontario on July 10, 1888. In 1914, he filed on a homestead at NW 16-79-14-W6. Kenneth enlisted in the Canadian Army at Lake Saskatoon in October of 1915. In September of 1916, he sprained his right ankle when he was buried by a shell. On June 3, 1917, Kenneth received a gunshot wound to his left arm at Vimy Ridge. He was discharged in May of 1918, having been found medically unfit - he had lost function of his left arm, and suffered from shell shock. Kenneth died on December 28, 1959. "When the platoon officer and all the NCOs of his platoon were casualties this NCO took command leading and directing them under heavy fire. Finally when the platoon were held up by an enemy machine gun post he rushed ahead killing and wounding the crew allowing the platoon to advance." Daniel was born in Underwood, North Dakota on February 26, 1898. He was living in Spirit River with his mother at the time of his enlistment in July of 1917; his land was located at S1/2 20-76-5-W6. Daniel was gassed (mustard gas) in October of 1918.